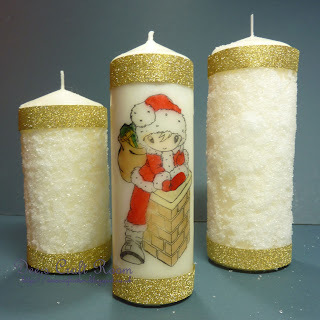 I recently saw some decorated candles on Facebook, they claimed that they had extra sparkle as they burned, from the candle light reflacted in the encrusted Epsom Salts. My regular visitors will know that I enjoy decorating candles, so I had to have a go at this. The Facebook post gave very little detail on how to do it, well no details really, so I had to guess. 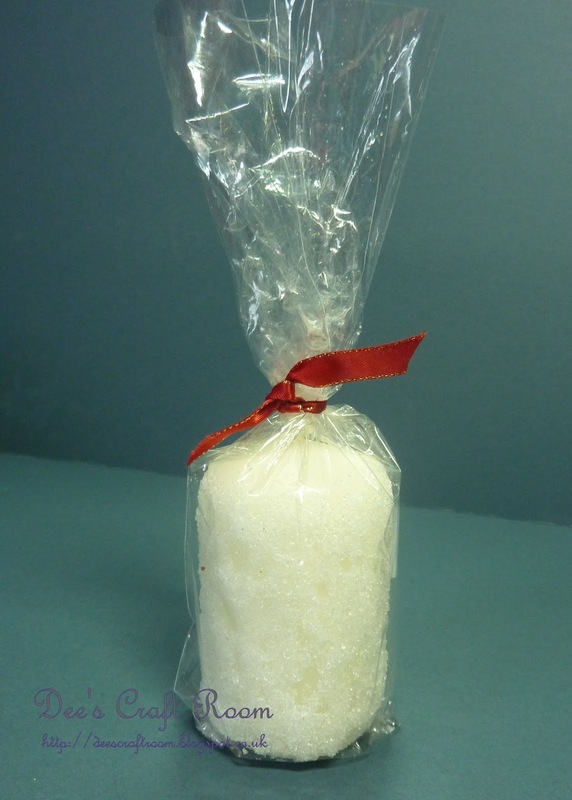 I used a paint brush to coat the candles in PVA glue and then I rolled the candle in a tray of Epsom Salts. If I am honest, I was not that happy with the results. 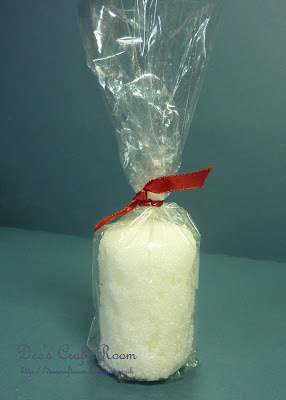 The glue started to dissolve the Epsom Salts and I had trouble making them stick to the candle - the results were rather patchy. Not exactly overwhelmes with my lumpy looking candles I decided to scatter into the mix some picture candles. This time I resorted to the tried and tested method for decorating the candles. 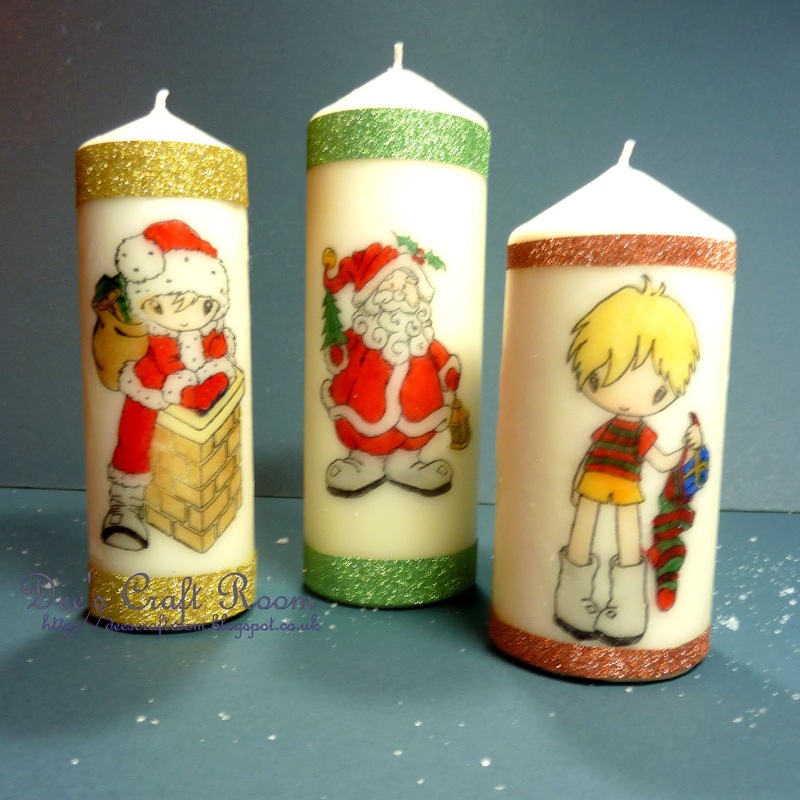 I stamped several Sugar Nellie Christmas stamps on to tissue paper and coloured them with Promarkers. 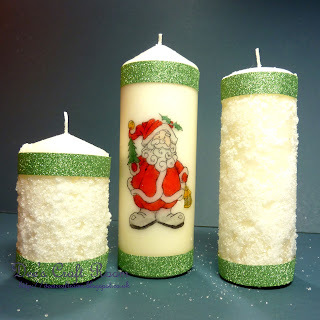 I then used my heat gun to 'melt' the tissue into the candle wax. I finished most of them off with some sparkly washie tape, this little one I left plain and wrapped it in celophane and a red ribbon. Those of you who are observant would have spotted that these candles were one of my Design Team makes for the Crafty Boots Christmas Challenge. That was a couple of weeks ago and the current Challenge is 'Winter Wonderland'. I am afraid that I am a bit behind with my posting, opps! Thank you so much Carol.